Whether you are looking to launch or revitalize a practice, this course is loaded with invaluable information for every acupuncturist or staff member. For years AAC has been asked to provide a practice starter guide, and we are now proud to offer a course that has been years in the making. 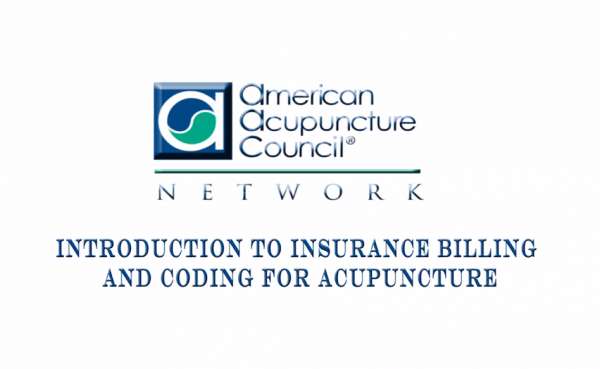 This 3 hour online webinar is for Acupuncturists or staff looking for the most solid introduction to insurance billing and coding the industry has to offer. Unlimited access for 30 days allows users to view and view again for maximum benefit of the material presented. Cash discounts? Can I charge more for billing insurance? Materials: Unlimited access for one month from date of purchase to: 3 hour video presentation, downloadable PDF of course power point and course guide. Requirements: Internet Connectivity and Updated Internet Browser + Computer Sound. 1. The video instruction is approximately 3 hours and can be viewed at your pace unlimited amounts of time by two IP addresses. 4. Attached is the PDF of the presentation that you may print or download to your desktop to follow the video instruction. The PDF is 99 pages in length.